Note: To use this app, please go to Settings on your Windows Phone. This app will NOT appear in your list of installed apps. 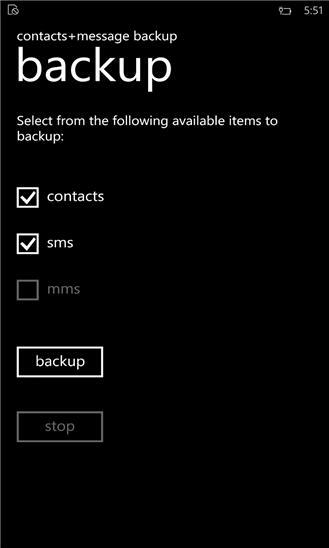 Contacts + Message Backup app is a Settings app that enables you to make backup of all your contacts (in VCF format) and messages (SMS & MMS including attachments) to SD card (in XML format) for later restore to same or another Windows Phone. Backup is stored in 'backup+restore' folder on the SD card. 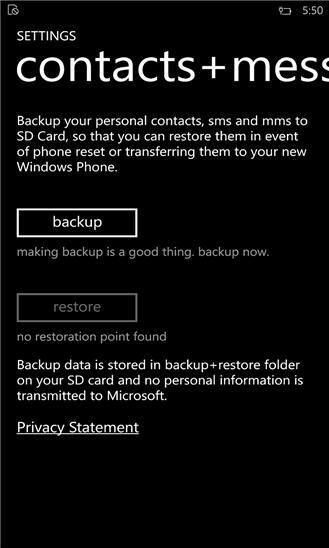 Known Issue: Restoring a backup of messages from a dual SIM Windows Phone restores all messages to message store for the first SIM/slot. Added Support for devices without SD card.